Are you young, busy, and socially active? 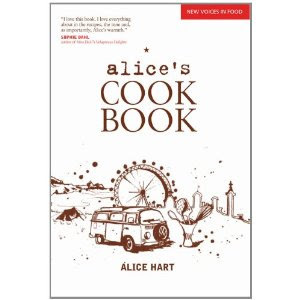 If so, Alice Hart wants you in the kitchen, with her cookbook, named simply Alice's Cook Book. Hart realizes that although most 20- and 30-somethings are in a constant buzz, they love to slow down and socialize with friends, preferably over good, honest food and drink. Therefore, she has divided her chapters by meal type then by occasion so users don't have to create their own menus. Hart's English pedigree is reflected in her selection of recipes, which include many Indian, French and English dishes, such as dahl soup, pear and almond tarte tatin, and Yorkshire pudding. Overall, the recipes are simple and straightforward. Ingredient lists are not overly long, and instructions are written in a conversational tone. I have made a couple of the recipes from this book and am particularly fond of the Roasted Carrot Hummus that has a pleasing sweetness and distinctive earthiness due to the addition of toasted cumin seeds. I served it as part of a crudite platter one evening, then smeared it on a grilled chicken sandwich the next day. Both were terrific. Emma Lee's photography is beautiful -- simple and artful. I only wish the book had more of it. So no matter how old you are, take Alice Hart's advice about spending time in the kitchen: "It's not just about cooking, it's about enjoying life." Tell me why you'd like to win this book, and I'll announce a winner (chosen randomly) on Sunday, July 17th. Good luck! 1. Preheat oven to 400 degrees F. Toss the carrots with the cumin seeds and some oil and seasoning. Spread out in a roasting pan and roast until soft and charring at the edges, about 35 minutes. Let cool. 2. 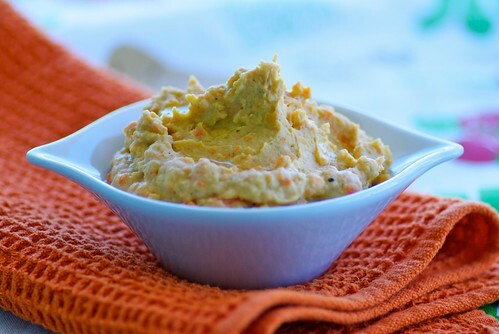 Combine the garlic, chickpeas, tahini, and cumin-spiked carrots in a food processor and pulse until coarse-fine. Add a slug of extra-virgin olive oil and a squeeze of lemon juice, then adjust the balance until you're happy. Serve with warm flatbread. I would love a copy of this book because I am a 23 year old gal who is teaching herself to cook. I love to entertain, but often have trouble knowing which dishes to pair together! What a great addition to hummus - it's a staple of our diet when the weather heats up! Would love to try this and all the delicious dishes you described from the book... Maple and Blueberry Sticky Rolls? Yum. I am new to cooking, so any resource would be super helpful! Well, I'm young, busy and socially active. Sounds like the perfect cookbook for my collection! My twenty something daughter is starting to cook. And to cook for a gathering of friends. Perfect! This book sounds fantastic. I am moving from New York to Colorado later this summer and will have to find whole new groups of people to host. With a whole new choice of recipes and menus, it should be easy to make new friends! We have friends over a few times a week, including Sunday brunch and at least one dinner or cookout. Some days I find myself spending more time in the kitchen than with them! This book sounds like it may have the solution I need. I read cookbooks like novels. So, I would love to win the cookbook! We make a similar version of this for an example of a healthy snack during my Cooking Matters classes - it's a sweet potato hummus with some reduced fat feta cheese added for zing - delicious with carrots and celery! Not a 20 or 30-something, however, I'd love to win this cookbook. I would like this book because I'm in my 20's and love to get together with friends over good food and good wine. It sounds like it would be a great resource for some new, fun and delicious recipes for our get-togethers. Oh, this book seems like a great idea for me. I enjoy cooking already but I find that the dishes I make for any family get together are too exotic. I could use some crowd pleasers! Thanks so much! Hmmm I would love a copy because I am a twenty-something year old who has five more years of school left and wants to still have a social life AND time to cook simultaneously! I'm a thirty-something and I would love a cookbook that plans menus for me! That's definitely one things I'm still trying to master. Thanks for the chance. is it wrong to want the book because i think the cover is adorable?! I would love this cookbook. Who doesn't love cracking open a cookbook and discovering new tastes and trying recipes. It's an advenyure. My boyfriend and I LOVE to entertain! But since we're both so busy it'd be nice to have someone else think of a meal combo for a change - especially when it's good to share. Looks like a fantastic book! I would love this book because, well, who doesn't want new cookbooks!? I would love to win this cookbook because I love to read cookbooks and I often have trouble coming up with food menus, but I love to entertain! We love hummus around here with a passion that borders on maniacal. I've made it with all sorts of ingredients but never roasted carrots. I simply MUST try this one out. Would love to add this to my collection. Bring it on! I definitely need this cookbook because I'm trying to develop my skills as a young home cook. I love baking, but struggle with actually cooking meals on the stove and this would be a wonderful help! I would love to win the cookbook because it sounds like there are a lot of recipes with unique flavor combinations. i would love to win this book because i love new cookbooks and new ideas. the hummus already sounds great! Roasted carrots sound like a wonderful addition to hummus - I bet this would be delicious with some feta sprinkled on top, too. I am a hummus fanatic! This carrot version looks fabulous...I'd love to win a copy of this book to test other recipes. Thanks for a wonderful promotion! I am a new stay at home mom who has just discovered a true burning obsession with recipes and all things that have to do with cooking, baking, chopping, boiling and mixing! I would love this cookbook. I love to cook fun new things for my husband, but at times I struggle with side dishes and what goes best together! I would love a copy of this cookbook. That Hummus recipe looks so tasty. My three year old loves Hummus of any sort and I would love to be able to make it for her and our guests when we entertain. I'm very sad that I missed this giveaway--the cookbook sounds great! Always looking for ways to use up the veggies in my CSA box and I always get stuck as what to make for my book club soirees.